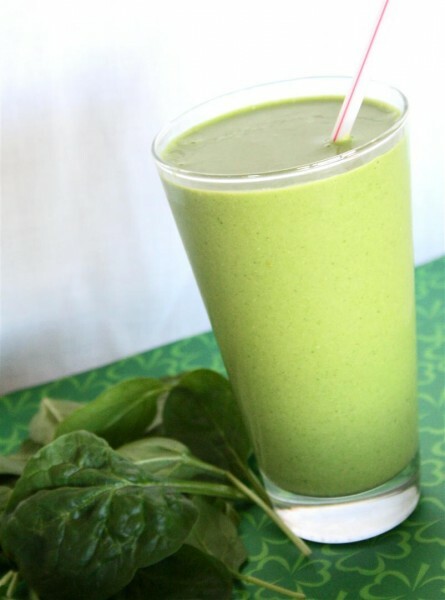 Green Goodness Smoothie was posted on March 17th, 2011 and is filed under Breakfast, Dairy Free, Drinks & Smoothies, Gluten Free, Recipes, Vegan. This entry has 9 comments. You can follow any responses through the RSS 2.0 Comment Feed. Hey guys, I’m back! Happy Saint Patrick’s Day! I’m fearlessly wearing green today…despite the fact that the only shirt I could find was an old, extra-large, tee-shirt. It’s obviously too big and extremely tacky. So yes, I look the opposite of a fashion statement, but hey! It’s green and I won’t get pinched…there are perks to appearing sloppy. This morning started with an epic, protein packed breakfast of an egg + egg white scramble with chicken chunks and goat cheese. Fueled up with that, I then did a 30 minute Nike workout with my i-pod. Seriously, this workout had me sweating…and by the end of it, I was shaking. I love the workout apps I have on my i-touch. Maybe in the near future I’ll do a post on all of my favourites! After my workout, I whipped up a green smoothie for me and my sister for lunch. It was so amazing I have to share it with you all. My sister said that it was the best green smoothie she’s had (and we make a lot of them!). I paired the shake with a few organic crackers with antipasto, a couple slices of fresh mango and a couple dates for dessert. I loved the fact that this drink dished out half the amount of vitamin A we need in a day, a third of the vitamin C, and packed a good punch of calcium and iron in as well! This smoothie serves 2. Blend in a high-powered blender. Feel good that you’re drinking something green on Saint Patty’s Day. What are you doing for Saint Pat’s Day? Do you have a favourite fitness app? This looks delicious! I’m getting a blender soon and can’t wait to try new smoothies recipes like this one. I’d also love to hear about your favorite workout apps. I’ve never used an app for working out but that’s a great idea. Hey! Glad you are back. This looks awesome. I’ve been looking for a green smoothie and will have to try it out tomorrow. Thanks for sharing! This sounds a lot like my green smoothie, except I’ve never tried the sesame seeds. Might give that a go! Stephanie~ I’ll try to get it out within the next week or two! Julie~ Me too! Hope you enjoy! Clarkie~ Guess we have similar tastebuds! Looks aamazing. Is is thick ….like eating with a spoon? Your favorite yogurt? Nevernotdreaming~ It’s not thick and it’s not thin. Drinkable, but I also often use a spoon whether I need it or not, lol. My favourite yogurts are organic Stonyfield in plain and greek yogurt. I’m so happy I found this recipe. Definitely gonna try it.